The University Art Collection, partnering with the Professor Stanley Rosenthal and the Printmaking Department of the James Pearson Duffy Department of Art and Art History, will present the Arthur C. Danto Printmaking Open house and Demonstration, on the second floor of the WSU Art Building. Funded through a grant from the WSU President’s Research Enhancement Grant (REP) for Arts and Humanities, the event will be open to the public, free of charge, 10 am to 3 pm, to experience the production of art prints in a professional print shop atmosphere, to witness the creation of two special editions of Danto prints, “The Writer Herbert Gold,” and “Bull” (to be sold to benefit the newly established Arthur C. Danto Printmaking Scholarship), and to learn about the various techniques and methods of printmaking. The REP grant will also fund the printing of 19 Danto woodblocks that are currently unrepresented in the suite of prints that came from Danto. Additionally, upon completion of the Danto Master Print Collection, the University Art Collection will create a special online-exhibition of the work, which will include an essay by Danto titled “Stopping Making Art,” as well as essays by WSU grad students in the Philosophy and Fine Arts, examining links between the artwork and philosophy of Danto. Many are aware of the enormous contributions Arthur C. Danto has made to contemporary art philosophy and criticism -- the ‘artworld’ as it has become known was first defined by Danto as a means to explain how Andy Warhol’s “Brillo Box,” of 1965 could be and in-fact was a work of art — but few know of Danto as a successful artists of the woodcut print, a decade-long career that preceded his tenure as eminent philosopher of our time. However, that is beginning to change. 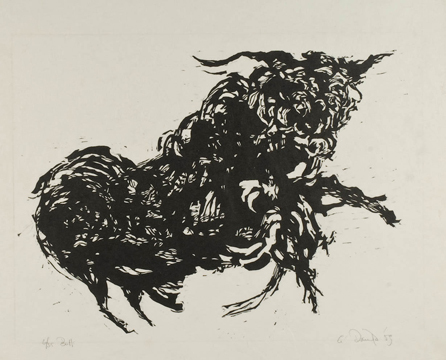 Spurred by an exhibition at the University of Illinois in 2009 that revisited Danto’s work as a printmaker, arrangements were soon after made for the entirety of his personal collection of work, both prints and the woodblocks themselves, to become part of the WSU Art Collection. His gifting of this body of work, a collection of 87 prints and 46 woodblocks, makes WSU the world’s foremost resource for scholarly research into the career of Danto as an artist. Danto, who grew up in Detroit and studied fine art at Wayne University (now WSU), had achieve considerable success as a printmaker from 1958 - 69 in NYC, exhibiting work in such places as The Whitney Museum and MOMA, before leaving art making to focus solely on philosophy and criticism.